NAIROBI, Kenya -- The Kenya Electricity Generating Company awards a contract to Austria-based Andritz Hydro to install a third 24-MW turbine and overhaul two others at the utility’s Kindaruma Dam. For more information, click here. Video: An interview with Robert K. Weir, president of Hydroscreen, LLC. WASHINGTON, D.C. -- Sponsorship opportunities are available for the upcoming 2010 National Hydropower Association Annual Conference in Washington, D.C.
DENVER, Colo. -- The United States Society on Dams asks USSD members to make nominations for awards to be presented at the upcoming annual conference in California. For more information, click here. TORONTO, Canada -- Algonquin Power & Utilities Corp. completes the acquisition of 36.8 MW of electrical generating assets located in New Brunswick and Maine from Integrys Energy Services Inc.
MANAGUA, Nicaragua -- Nicaragua's government signs a financing agreement with the Central American Bank for Economic Integration for development of the Larreynaga hydroelectric project. For more information, click here. LUSAKA, Zambia -- The Zambian government and the Export and Import Bank of India sign a US50 million loan to help develop the Itezhi-Tezhi hydroelectric project in Zambia. The California Department of Water Resources improved unit availability and reliability and increased efficiency by as much as 6.5 percent at its 645-MW Edward Hyatt pumped-storage project through a comprehensive rehabilitation. KAIFENG, China -- China Valves Technology Inc., a metal valve manufacturer with operations in China, signs a letter of intent to acquire 100 percent ownership in Able Delight Valve Co. Ltd., a valve manufacturer specializing in hydropower and other water and energy-related fields. For more information, click here. Ludeca offers Inclineo, a shaft plumbness measurement system that uses electronic inclinometer technology with a resolution of 0.0003 degree, the company says. WUERZBURG, Germany -- DSD Noell GmbH of Germany receives a contract from Kraftwerke Linth – Limmern AG to design, supply and install two penstocks for the pumped-storage plant Linthal 2015 in Switzerland, DSD Noell reported. 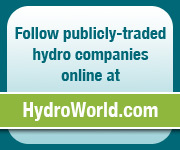 TULSA, OK. -- HydroWorld.com enhances its “Events” page, with expanded hydro event listings and other upgrades.